Our second day in Ghana began with the continuation of our work at the Komfo Anokye Teaching Hospital with Ghana’s beloved speech therapist, Albert Osei-Bagyina. The sweltering heat went unnoticed as our morning filled up with young children and their dedicated parents. One man shared that he had left home at 1 am that morning, taking half a day’s trek to wait with his 3 year old daughter until we were able to see him at 2 pm. We were determined to give the highest standard of care while seeing as many patients as possible. The day ended on a successful note with our three separate groups providing recommendations to parents of 21 children in under five hours. Exhausted from the morning’s fast paced events, we were thrilled and privileged to be invited for the first time to Albert’s residence for a home cooked feast. The feast was prepared by Albert’s wife and children. 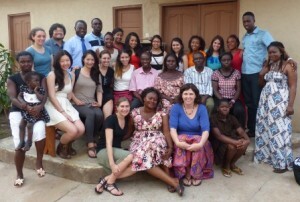 Dr. Crowley said it was undoubtedly the best meal she had had in her eight years visiting Ghana. We were lucky enough to try Ghana’s famous cultural dish, Fufu – peanut soup with ground plantain, cassava, and fish. The hospitality provided to us by Albert’s family made us feel at home. But more than that it made us feel like a part of Ghana, a place full of warmth.